The Barnard 68 molecular cloud as viewed by ESA's Gaia satellite after its first 14 months of operations. 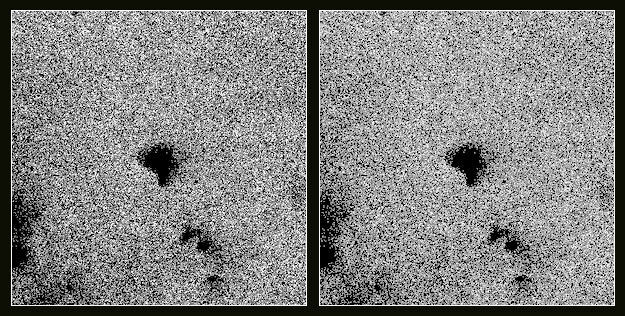 These views are not a photographs but were compiled by mapping the total density of stars (left) and the total amount of radiation, or flux (right), detected by Gaia in each pixel. As shown in these images, there are no stars observed in this dense nebula, which is thought to be a stellar nursery cooking up stars. Data from Gaia's future releases might help astronomers study the three-dimensional structure of this cloud by measuring distances to the stars near its edges. This image was produced by André Moitinho, Márcia Barros, Carlos Barata from the University of Lisbon, Portugal, and Hélder Savietto from Fork Research, Portugal. The creation of this and other similar images is described in the paper "Gaia Data Release 1: The archive visualisation service" by A. Moitinho et al. 2017, A&A, 605, A52.